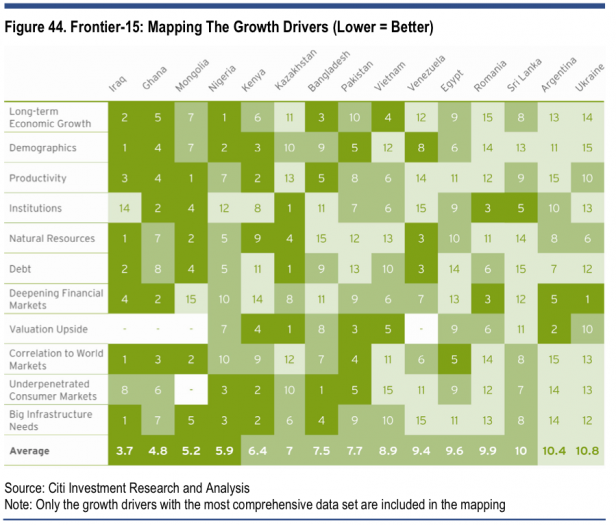 This very comprehensive graph is from a recent report by Andrew Howell from Citi Research and Analysis. Frontier markets are pre-emerging countries. Think of Brazil or India 10-15 years ago. What if you had a chance to invest in Thailand in the 70s? Here is a solid summer edition. It is fully loaded with some good content. Take the time to read it. I covered the Facebook, video games, RIM, oil peak,Windows 8, Apple, Euro 2012 odds, the Yankees, and the next tech war. Also if you want to learn more about investing in frontier markets I invite you to read the Leopard Capital blog at www.emergingfrontiersblog.com. The guys (including myself) are doing a great job searching the best pieces of news out there and writing article. How do you Fire 10,000 employees? Ask Nokia. This is how Nokia announces firing 10,000 employees and more bad quarters ahead. Strategy Sharpening = cutting 10k jobs. Updates on targets = Much worse than expected quarters ahead. Now this is how you spin news. They are both heading for the slaughter house. RIM is trading at the $9.99 special. RIM is exploring potential options with two banks. Facebook is the new rumored name to acquire RIM since Facebook is looking to build a phone and the acquisition might accelerate the process. RIM is also suffering on the potential consumer side. Potential Blackberry buyers are not buying the current model because they know that the next one is coming out in the falls. So less cash is coming in and adding to the suffering. Your Gordon Gecko side might come out with this special situation. If you want to speculate you might want to study the special situation that is arising with RIM. The company is trading below its book value. The “book value” of a company is defined as the value of assets minus liabilities. For RIM, that value is about $19.45 per share. The tangible book value is $13.58. TBV excludes goodwill and intangibles. Basically you are minimizing the downside. The key to success here is to have a special buyer aiming to buy the whole company or some of the assets. The risk here is that it is not guarantee that somebody will step up and you might have to bleed for a while. To reassure yourself, somebody (HP) bought the money-losing debt loaded Palm. Don’t ask why but Palm had their spot reserved in the graveyard. RIM is still somewhat profitable with a solid user base and a nice collection of patents. Apple replaced Microsoft as the new corporate hate leader in high tech. Any time there is a leader you start getting labeled and the hate. Think of Nike in the 90s with the terrible sweatshop situation. It was Nike that was getting its name drag in the dirt, not New Balance. Apple is starting to suffer for being anti-union, anti-American, a tax dodger, and for the terrible working conditions in Taiwan etc…these are usually side effects of being too successful, too powerful and too controlling. And Google is competing for the title. Did the FB IPO ruin your Mother’s Day? It was supposed to be the gift of a lifetime for your Mother’s Day but it back fired big time instead. Before the IPO the media played the “get rich quick and easy” card. The insiders, Mark, the venture capitalist, Wall-Street and Bono made money on FB. The only one that got broke are the main street investors. Now the media are playing the Facebook apocalypse song. Now FB is still trading for 64B as of June 16th. It came out of the gate close to 100B. As you can see by the graph above the back the napkin valuation is still out of whack. How do you justify a 75x price/earnings ratio when the average is 14 times. The “average” ratio is from companies with a proven business model, which FB doesn’t have. FB hasn’t penetrated China yet, hasn’t figure out how to make money on the mobile and people like GM dropped their ad budget from FB because of the lack of results. So how much is FB worth? Nintendo Wii U was the first one to announce their next toy at the E3 conference. Microsoft and Sony are working on the new models but haven’t unveiled their plans yet since their current consoles are in their most profitable phase of their life-cycle. Zynga is trading for $5, way below the IPO price and the high of $14.56 back in March. It has a market cap of 3.75B. EA is trading for 12.25$ and has a market cap of 3.91B. The company is struggling to boost digital revenues as sales of traditional consoles are slowing down. It has issued a lower than expected revenues warning. Both companies have been beat up with a 50% loss in stock price this year. Activisions and Take-Two are also struggling with a slowdown in sales. In one of my previous post I have mentioned that the discovery of proven reserves continues to significantly outpace the rate of extraction. Well it is getting more and more so. Look up the Bakken formation. It is the largest oil find in North America in 50 years+. It stretches from North Dakota, to Montana all the way to Canada. Another step towards energy independence. The US has been labeled to “Saudi Arabia of natural gas” by Barrack Obama. There is so much of it. Canada is swimming in it too. So much has been discovered, extract and oversupplied that the price of natural gas has crashed below $2.00 for a while. It has since recovered a bit but with so much oversupplied don’t expect a rally anytime soon. On June 18 Microsoft will unveil its own tablet next week with probably equipped with Windows 8. This is a major departure of partnering with major computer makers. That will give Microsoft the power to totally control the user experience, just like Apples. The stock finally broke the $30 bar for the first time in a very long time. It is trading at a P/E of only 11x with a dividend yield of 2.70%. MSFT is sitting on $50B in cash and will use it to either: 1- Make acquisitions (they are), 2- Increase the dividend payout (they did) 3- Share buyback 4- Special dividend (did that too) and there is no debt to pay. The stock is on the upside because of the optimism surrounding Windows 8, their next major software launch. Windows 8 is expected to be the next big thing for Microsoft. Expect a major redesign. It is supposed to have the speed and reliability of Windows 7 with a touch screen interface. A major feature is to have one operating system of all devices. Mobile, pc, Xbox, tablet etc……Early reviews likes it so far but have struggle to adapt to the new design which is supposed to be nothing like the previous Windows OS. Windows 7 cracked the 500 million sales and recovered the lost sales with the terrible Windows Vista. Looks like it’s going to be an interesting fall. Can the BB 10 compete? All eyes are on Lebron & friends to see he can’t finaly get his first title. Odds are slightly favorite towards the Heats. Yahoo Sports and New York medias are circulating that the Yankees might be for sale. The Steinbrenners family denies everything and keeps stating that they are keeping the team. But in life everything has a price. After watching the Dodgers’ transaction for +$2 billion, I can’t blame the family for trying to find how much their team would go for. How much for the team, the franchise, the global brand, the ballpark, the YES network? Twice the sales of the Dodgers? Old man George bought the team for $10 million in 1973. He is probably one of the few that ever made money with a sports franchise.